The herder is called Omulisa- the one who feeds. 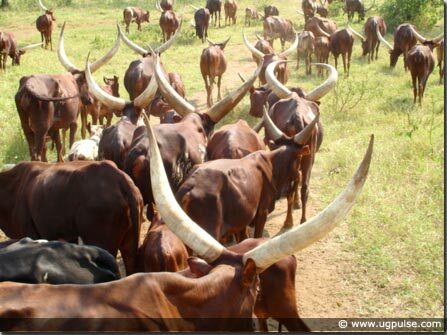 Despite the harsh conditions they seem to operate in, Uganda's cattle herdsmen (call them pastoralists or nomads) still enjoy their centuries-old and enduring tradition in many parts of the country almost unabated. Although numerous legislations and increased land acquisition by private developers have curtailed the herdsman's much cherished heritage, the tradition is still enjoyed in parts of the country with communal land ownership land tenure system. Josephus Biramba herding his cattle. But even to the herdsmen who have acquired private land, herding remains a much loved activity. According to the 52-year-old Josephus Biramba, spending the whole day trekking after cattle gives a herdsman a close association with them, learning their behavior and understands their 'language of communication'. I can tell a cow that is having labor pains hours before the time of delivery. This way I can tell whether it will be able to deliver by it self or needs help. Sometimes a calf's head is facing in wrong direction. This requires urgent attention by a herdsman to save both the calf and the cow," says Biramba who says he is an expert in taming labor-pain induced wildness in cows. For Willy Kamulasi, cattle herding traditionally means love and care to the animals. "When I spend time with my cows, I direct them in areas with fresh pasture, take them for water and I am able to tell their needs. I call them by names (names are given according to skin color or spots) and they respond. I know each of their strengths and weaknesses," declares Kamulasi with a sense of pride. Kamulasi communicates with the cattle by whistling or heckling at them usually ordering them to change direction, halt movement or reminding them to go for water. In a life of a cattle herder, it is a mixture of culture, business and sometimes survival. It is a tall order of a duty mostly carried out by boys and girls of school-going-age. Most of these boys and girls skip school in order to herd cattle or juggle both by herding and attending school in shifts. As I soon discovered on my first date with cattle herding, you have to be very patient while trudging behind animals, seemingly enjoying their meal, and dictating both the pace of movement and the next direction you take. There are few occasions where you are expected to force the herd to change direction. Cows setting off from Kraal. Among the typical cattle herding communities in Uganda it is a sun-rise to sun-set duty where a herder spends an entire day (usually from 8am or earlier during dry seasons to 8pm) moving around and about covering tens of kilometers. On this occasion, my co-herder is a 14 year old boy, Geoffrey Mukimbiri. As we set off around 9am, he warns that the herd is likely to move faster and further. "It is also likely to be very hot and torrential rains later on in the afternoon," he further warned. Equipped with herding sticks, gum boots, (car tire sandals for my co-herder) and jackets we set off. As if to prove my co-herder right, the herd sets off at a swift pace leaving behind a gathering dust. We followed diligently. In less than an hour, I could not even trace my way back. We seemed to have covered miles. The midmorning heat was starting to bite and soon the jackets seemed useless and very heavy. By midday, I felt thirsty and my legs were seriously calling for rest... But my compatriot and the herd seemed like they had just gotten started. At about 1pm, the herd's pace subsided. Some stopped taking any more pasture and resorted to chewing cud. Was it a sign of satisfaction? I asked my guide. "They are just resting. Cows do not like feeding when it is hot," he assures. Meanwhile the calves start mooing searching for their mothers for a midday suckling bonanza. "It is time to take the cows for watering," declared Mukimbiri disrupting my minute-long rest. Stretching and folding his lower lips he made a sharp whistling sound. He describes it as a signal for cattle to go for water. Immediately, the herd responded and changed direction moving at a fast pace. He ordered me to chase from behind and ensure the entire herd followed as he rushed to join the lead group of cows. Once at the watering point, the cows are released in a group of less that ten or slightly above. 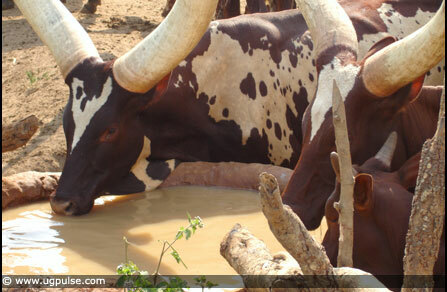 The watering point at the edge of a valley dam is locally known as Ekyesherero-place where cows drink water. It is made out of clay, thick sand and red soil. It is constructed in a circular form and holds about 1500 liters of water once full. A small channel is constructed from the main water body of dam bringing water near the Kyesherero, which stands at higher level. 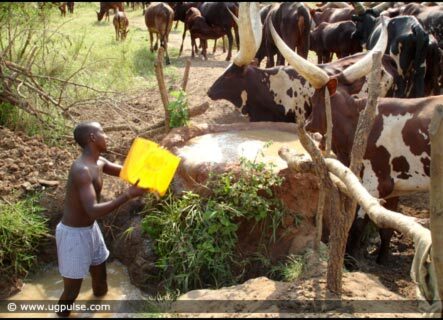 A man stands in the channel and scoops water using a bucket to re-fill the kyesherero as the animals gulp liters and liters of water. Meanwhile, they are supposed to mention encouraging words to the cattle while mentioning their names. Despite improved economic growth in Uganda which has led to a transformation in the lives of its people especially in the ranks of middle-class echelons- nomadic life styles and other traditions like hunting wild meat for survival show how well the country's long-standing and varying traditions have stood the pace of change. 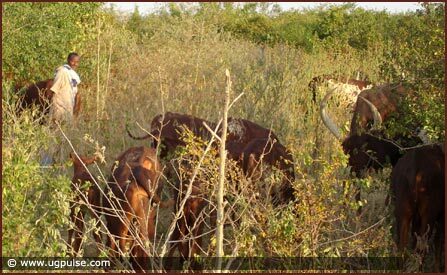 Just like some hunters who enjoy it as a heritage, even cattle herding is taken not just as a job but also a social duty. Many young people make friends and meet their future suitors during cattle herding. In Uganda, the practice is mostly carried out among the Bahima, Banyarwanda and Karimajong farmers (originally nomads) located in Uganda's cattle corridor- which covers districts like Kiboga, Mubende, Mpigi, Rakai, Masindi and Hoima and in the Eastern Uganda districts of Kotido, Moroto and Nakapiripirit among others. The Runyankore term Okulisa ente- if translated directly means "feeding cows". And the herder is called Omulisa- the one who feeds.On a typical day, a herdsman wakes up at about 5am. The early morning activities include a quick head count of the cows (mostly done by swift glances since he or she knows all of them by color, name and numbers) to establish whether they are all-around. Here he is also able to diagnose the sick ones and inject them where necessary. Then comes the exercise- milking cows. The time taken while milking a single cow depends on how much milk there is in a cow's udder. Long horned local breeds, very common in Uganda, give about two liters or less. According to Livingstone Mugenyi, a cattle keeper in Kibimba Ggomba in Mpigi district, the milking session is the most lively morning activity because of the extra noise provided by mooing cows anxious to feed their calves. After milking, the day's herder sneaks in a house to get the day's only meal. It is usually cold milk or unpurified yoghurt or warm raw milk with posho(maize or corn meal) or cassava prepared the previous night. Meanwhile, the cows are being dispersed out of the kraal and soon, the herder follows. "In the morning hours, cows are swift. This is because they are hungry, but also the pasture being fresh," says Mugenyi who says he enjoys early hours of herding. He adds "cows like going in the direction of where the wind is blowing from. The reason is because they enjoy the breeze and feel the wind chases away biting flies." And biting flies do not spare humans either. One sting almost sent me packing. To learn more about Ultimate Media Consult go to www.ultimatemediaconsult.com. Enoch Mutabaazi is a media practitioner at Ultimate Media Consult with more than six years experience in the print and electronic media. Since he majored in Broadcast Journalism at his graduate studies Mutabaazi first worked as a reporter at Uganda Television (now Uganda Broadcasting Corporation TV) before he discovered his multidimensional skills in writing and public relations at Ultimate Media Consult. He is currently the Production Executive at Ultimate Media Consult (U) Ltd and writes occasionally. Her Royal Highness Nnabagereka Sylvia Nagginda Luswata in Washington D.C September 02 to September 03, 2010. The Nnabagereka is on an official visit of the United States in an effort to promote the role of culture in Africa's development as well as to promote and raise awareness for cancer research and the Nnabagereka Development Foundation (NDF). The moral question is if all other attempts have been tried and failed, why doesn't the world listen to voices of people who say we are ready to forgive? We do not need cosmetic justice but need real peace that is long lasting, not grave yard peace where after every one is dead there is peace. Usually sipped from enkyeeka (a small gourd) or a half litre mug (usually called gamma), obushera butookoo has for long been the Bakiga's favorite thirst quencher. Although all Nubians are Moslems, the first bride has the option of demanding that the groom never takes on another wife. After getting familiar with the visitors, the hosting spokesman mentions a set of conditions and expectations upon which the issue of bride price can be discussed.